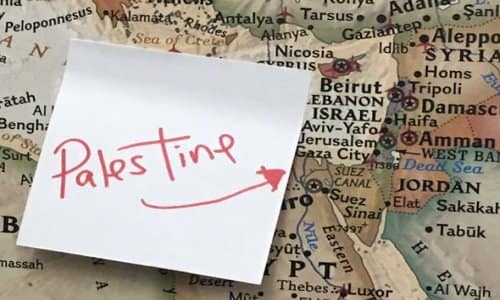 Is It Islamophobic To Deny That 'Palestine' Exists? Despite repeated comments in which she repeated hateful anti-Semitic tropes, Rep. Ilhan Omar (D-Minn.) escaped even the mildest slap on the wrist from her congressional colleagues. But it turns out that Kalman Yeger won't get off so easy. Yeger, a member of the New York City Council who represents a heavily Jewish district, is in trouble for offending New York's Arab and Palestinian community with remarks that some have interpreted as Islamophobic. But unlike Omar--around whom many Democrats circled the wagons in order to prevent offended Jews and pro-Israel members of Congress from forcing her off the House Foreign Relations Committee--it looks as if members of his own party are abandoning the Brooklyn Democrat. What did Yeger do? He denied the existence of a country named "Palestine," as well as earlier casting doubt on the authenticity of the Palestinians themselves. That was enough to draw the opprobrium of fellow Democrats City Council Speaker Corey Johnson and Mayor Bill De Blasio. The two asserted that if Yeger didn't retract his comments, he should be booted off the New York legislative body's Committee on Immigration. Yeger has refused to back down, with the kerfuffle leading to a noisy standoff outside his Brooklyn office, where demonstrators and counterdemonstrators exchanged insults. Late on Monday, the Council's leaders made good on their threat and removed Yeger from the committee. Will this have an impact on the Middle East? No. But as Linda Sarsour--a notorious anti-Semitic Palestinian-American activist and leader of the "resistance" to U.S. President Donald Trump, who has been drawn into this fight--observed, it may mark the first time an American politician will be made to suffer for having offended Palestinians and those opposed to Israel's existence. Yeger's defense rests in both context and a geographic fact. His initial comment came in a response on Twitter to the idea that Ahmed Tibi, one of the leaders of an Israeli-Arab political party, would become prime minister of an Israeli-Palestinian state that would theoretically replace Israel. He said it proved "the ultimate goal of the so-called Palestinians is the destruction of the Jewish state and its people." He then responded to criticisms of that tweet with another that escalated the argument: "Palestine does not exist. There, I said it again. Also, Congresswoman Omar is an antisemite. Said that too." Is this analogous to Omar's talk of Jews hypnotizing the world, being disloyal Americans and buying Congress to support Israel? Palestinian Americans and some of their supporters assert that any denial of their existence as a people, or that the place they consider their homeland is called Palestine, is hateful and delegitimizing. Prior to 1948 and the birth of Israel, the only group that answered to the name "Palestinians" were Jewish residents of the British Mandate for Palestine. Non-Jews who lived there considered themselves Arabs, not Palestinians, because there had never in history been a separate Palestinian Arab political entity or, prior to the birth of modern Zionism, a national movement that represented the ambitions of such a group. It was only after the birth of Israel that the Arabs embraced the name Palestinian and claimed that the country was "Palestine," rather than a section of Syria or the Ottoman Empire. While their national movement is of relatively recent vintage, there is no denying that it does exist now, and it represents the ambitions of millions of people who call themselves "Palestinian." To deny that there is a Palestinian people is to deny reality. Calling them "so-called" is a pointless insult, not a refutation of their political demands or tactics. However, Yeger is not wrong to point out that while "Palestine" is recognized as a "non-member observer state" by the United Nations, it is not an actual, functioning country. The Palestinian Authority autonomously rules most Palestinians in the West Bank, but does not exercise sovereignty. Hamas does exercise sovereignty in the Gaza Strip, but is not recognized by anyone since it is a terrorist-run tyrannical state. But the reason why "Palestine" isn't a country isn't a function of prejudice. De Blasio is a supporter of Israel and AIPAC, but he still chided Yeger, saying that denying the right of the Palestinians to a home is a form of prejudice. The trouble with that argument is that Palestinian identity has been inextricably tied to denying the right of the Jews to a state in the same country. Those who advocate, as the New York City mayor does, for a two-state solution to the conflict assert that there is a way for both peoples to have a home alongside each other. However, when people like Omar, Sarsour, Rep. Rashida Tlaib (D-Mich.) and the BDS movement they support--let alone the leaders of Fatah or Hamas movements--say "Palestine," they are not referring to a separate state next door to a secure Jewish state. They are, instead, referring to their hope of replacing the State of Israel with a Palestinian state that will deny the right of the Jews to self-determination. Opposing that ambition--as Yeger clearly intended in his original tweet--is not Islamophobic or even necessarily rooted in hate against Palestinians. While Yeger's willingness to oppose Israel's foes in this manner was not the sort of thing that will bring Jews and Arabs together in an ethnically diverse borough, it's also not the same thing as Omar's anti-Semitic statements or her support of a BDS movement that aims at Israel's annihilation. Foreign policy has long been a theme of New York politics, and in years past, mayoral hopefuls often felt they had to demonstrate their support for the three "I's": Israel, Ireland and Italy. But if support for "Palestine," whether alongside or replacing Israel, is now a requirement, Sarsour is right about a sea change in the city's politics and that of the Democratic Party that dominates it. Now that the same party that shielded Omar has punished Yeger, it certainly won't strengthen the Democrats' efforts to be considered a pro-Israel party.